When asked about why acquisitions fail, most deal professionals can name the immediate causes—loss of key personnel or customers, culture clash, or overly optimistic synergies not realized, to name a few. But higher-than-acceptable failure rates and the wisdom of twenty-twenty hindsight suggest that more fundamental drivers—the “causes of the causes”—might shed light on barriers to deal success and how the risk of failure can be diminished or eliminated. 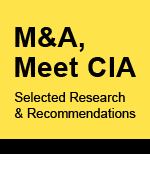 Corporate directors, operating executives and advisers involved in M&A could stand to learn from one organization in particular that is dedicated to preventing surprises: the Central Intelligence Agency. Many of the factors that cause unforeseen M&A events trace their origins to the same factors that led to past CIA stumbles. Based on analysis of agency failures or near-misses, along with results of a survey of executives and advisers involved in M&A, we’ve distilled three key lessons to improve acquisition success. As history has shown, those who cast doubt on a decision often are considered naysayers, and their reasoned warning is ignored. One well-known example in the intelligence community is the lead-up to the Cuban Missile Crisis. In August 1962, CIA Director John McCone was briefed that the Soviets were placing surface-to-air missiles in Cuba. The agency’s regional experts told McCone not to be alarmed—the USSR gave weaponry to many client states. Yet McCone worried that Cuba could become a base for nuclear missiles. He ultimately was proved right, and the Cuban Missile Crisis ensued. He anticipated the problem, but dramatic delays in responding to that reality resulted from his fear of being written off by colleagues at Langley. Similarly, acquirers tend to be composed of tightly integrated teams with a can-do mindset and shared assumptions. But the unity that makes these teams successful can backfire when evaluating something outside of business-as-usual—such as in the case of M&A. The same corporate culture that values alignment to get things done risks suppressing discussion of alternative acquisition scenarios and outcomes. Each deal is unique, and urgency during a deal process can disrupt efforts to think things through. The authors of this article conducted a survey in summer 2017 in which we asked 200 executives and advisers involved in M&A about their pre-acquisition planning and strategies for success. The results showed that half of respondents considered team members who opposed deals or highlighted problems to be helpful, but nearly 20 percent considered them a “distraction.” Firms in the latter category risk losing out on the benefits of constructive dissent and harnessing differing perspectives. Companies should recognize that the same unity that makes a team work well together can become a risk-management problem during the acquisition process. Contrary to being a “distraction,” sometimes an executive is of greatest value when challenging the consensus opinion. In national intelligence, working from incorrect, insufficient or unidentified assumptions is often described as “solving the wrong puzzle.” Lots of information is being collected, but the questions directing and interrogating those data are flawed. It’s the same for acquisitions, especially when they are driven by formulaic due diligence checklists. Even when customized by industry, these lists are often generic, and they are rarely used to test basic assumptions. Deal professionals know the surprises of M&A do not just come at the start; the real problems come after the deal and stem from a variety of factors that don’t fit neatly on a checklist. Intelligence analysts strive for multiple, independently verifiable sources for all important questions. Likewise, when asked about the pre-closing activities that are most helpful in preparing for operational success during M&A, respondents to our survey echoed the need to move beyond due diligence checklists. They cited strategies that include customer calls and other probes into a target’s customer base, along with cultural evaluation. Questions and assumptions matter at least as much as the quality of the answers that a team collects about an acquisition target. Acquirers should use due diligence to discover new questions: What underlying hypotheses and what assumptions are driving this deal, and how can they be tested? For Denver-based Lion Equity Partners, which has developed expertise in acquiring corporate carve-outs, evaluating value and risk requires going beyond due diligence checklists and information provided by the seller, says Jim Levitas, co-founder and partner at the firm. It goes without saying that an acquisition’s numbers need to add up, but they can also mask critically important sources of success or failure. Sometimes a single fact or anecdote is not “just one data point”: it is a non-quantifiable deal-killer. The problem is not unique to business. The CIA has struggled with a culture of so-called scientism, where evidence perceived as scientific is given more weight, often because the intelligence consumers—from the U.S. president on down—demanded “facts.” This has often led to excessive quantification, and the truth almost always looks better when dressed in numbers. On the flip side, the inability to quantify may lead to omission. The CIA, for example, failed to fully understand the collapse of the USSR. As author David M. Kennedy writes in “Sunshine and Shadow: The CIA and the Soviet Econ­omy,” the CIA overlooked a key shortcoming of the USSR—its inability to meet the needs of its people. “Shortages, queues, rotting potatoes and exploding TV sets were hard to quantify, but they mattered a good deal to the Soviet citizenry and arguably thus to Gorbachev and the Kremlin,” he writes. To gauge deal-makers’ perspectives on the power of numbers, in our survey we asked whether the vast majority of risks in an acquisition can and should be quantified. The responses are telling. More than two-thirds of executives see risks as largely quantifiable, a sentiment highest among senior executives. Eight of the nine CEO respondents were highly enthusiastic about quantification. Numbers are a great safety blanket, but when a primary source of post-closing surprises stem from cultural integration, executive retention and customer loss, how much of the real risks can be quantified? The presumption of quantifiability will drive processes and recommendations that may stymie an acquirer’s preparation for unforeseen events in the real world of M&A. Stories of M&A failure abound, but much can be learned from past mistakes in other organizations. Silencing dissent, focusing too narrowly when information-gathering, and giving too much credence to numbers has caused both acquisitions and intelligence operations to go awry. M&A professionals would do well to take those lessons to heart and build an internal team culture and best practices to support acquisition success. Access selected research data and a summary of recommendations in a supplementary report from the authors. Joseph Feldman is president of Joseph Feldman Associates in Chicago. Email: jf@josephfeldman.com. Dr. Milo Jones is a visiting professor at IE Business School in Madrid and the co-author of “Constructing Cassandra: Reframing Intelligence Failure at the CIA, 1947-2001.” Email: mjones@faculty.ie.edu. Aaron Polack is the head of business development for Lion Equity Partners in Denver and a director on the ACG Global board of directors. Email: apolack@lionequity.com.